Browse > Home / Uncategorized / See 3 Plays at the Canadian Stage Company for ONLY $56! See 3 Plays at the Canadian Stage Company for ONLY $56! Now that the holiday season is coming up, it’s a good chance to make use of this special holiday deal that allows you to get access to theatre seats for the same cost at the movies! For only $56, you can watch plays for under the price of $20 per play. These tickets are 80% off the regular price and can make great holiday gifts if you want to treat a friend or family member! Get in front of the line and reduced ticket prices! To explore more about becoming a Visionary member and making use of this great deal, more information can be found here. Join the fast-growing Canadian Stage Visionaries through this special offer and experience a new year full of fantastic theatre! The Canadian Stage Visionaries, a group of under-40 professionals at Canada’s largest contemporary theatre company, hosts a series of awesome theatre-inspired events. 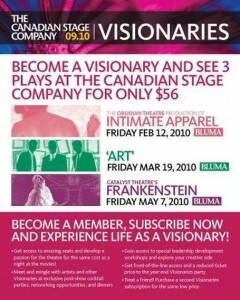 Visit www.theatrevisionaries.ca or email visionaries@canstage.com or call 416.367.8243 x277 to find out more and to join us today!